‘With a pounding heart of 145.45cc pushing 7hp of raw power to three tiny wheels, the humble auto-Rickshaw is a feat of non-engineerance. Loud, uncomfortable, prone to breaking down a lot and completely useless at protecting you from the elements, rickshaws are undoubtedly the ultimate long distance, off-road machine. Despite being designed for short distances, on roads. Possibly the least suitable vehicle on the planet for covering the entire subcontinent in two weeks. Perfect. 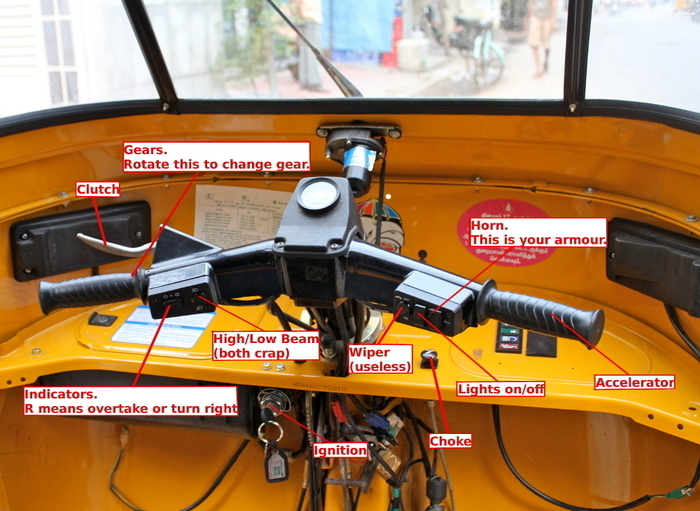 We’ve never driven a rickshaw before. Apparently it’s a little like driving a Vespa, only it breaks down more. We’ve never driven a Vespa either. Helpful. The Adventurists have provided the guide below to help out novices like us..! Make sure the ignition is switched on. Make sure you’re in neutral (much harder than it sounds). Pull the starting lever (normally more than once). Apply the clutch and put into gear. Release the clutch slowly whilst giving it some juice. Push the rickshaw out of the river. Try again from point one, but try and keep it on the road. That’s it, now move up the gears. Try to drive it 3500kms without crashing. Easy.